Yeah. I know. That kindle does not look like this kindle. 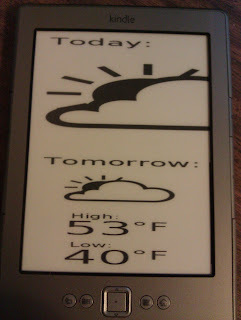 I've been poking around off and on all weekend trying to get the kindle set up as a weather display. The first snag I hit was getting python installed on a Windows server. I found this helpful tutorial and was on my way. I tested a few python scripts, confirmed it worked, and moved on to the next problem. rsvg-convert is a tool to convert svg files to png, which the Kindle reads. It's also a linux library. So there isn't really support for it in Windows. I also couldn't find any easy alternatives. So all that time setting up a server to support python in Windows was kind of a waste. So next up is poking around on a Linux box trying to get everything set up. The image is also formatted incorrectly because, I assume, I'm running the files in windows and they're not resizing properly. And the forecast isn't actually for where I live. It's just a random location. I haven't even gotten to setting up that portion. 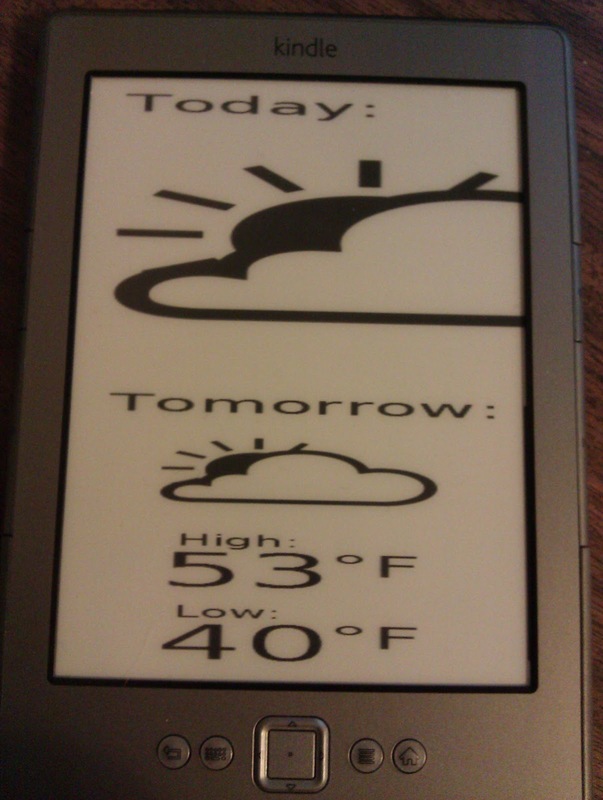 And I haven't even started trying to get everything to run locally on the kindle yet! I'll have to spend more time on this over the long weekend since I've spent a fair amount of time playing Guild Wars 2 in their special event this weekend instead of problem solving. That image is a result of a .png with a "color" colorspace. It will display correctly with a greyscale colorspace. In the original script, pngcrush was used to get a greyscale colorspace. 1332/365 - Pi in a Box! 1330/365 - Strip of Lights!